The roots of the Wistar Institute go back to work of the physician Caspar Wistar, who from the early late 18th century started building up a collection of anatomical human specimens at the University of Philadelphia for teaching purposes and anatomical research. After Wistar's death the physicians William Edmonds Horner and Joseph Leidy continued to add to this collection. During the late 1880s a campaign was mounted to transfer the collection to new premises with the aim of creating an institution to further research in the biological and medical sciences. 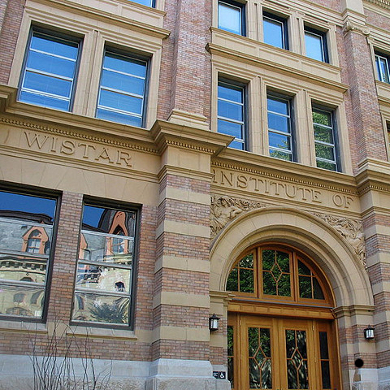 The Wistar Institute officially opened in 1892, supported by funds from Colonel Isaac Wistar, the great nephew of Caspar Wistar. It was the first independent medical research institute established in the United States. In 1906 the Wistar developed and bred the Wistar rat, the first standardised laboratory animal. Over half of all laboratory rats in use today are thought to descend from this breed. By 1925 the Institute had built a sold reputation in biology and was recognised internationally as a training ground for young scientists. From the 1950s, under the leadership of the Polish virologist Hilary Koprowski, the Wistar Institute started to gain international recognition for its vaccine development and cancer research. In 1979 the Wistar gained worldwide attention for the fact that its scientists had been granted the first patent on monoclonal antibodies, a technology that would be at the forefront of the biotechnology revolution. Today the Wistar Institute has more than 29 laboratories grouped around three research areas: gene expression and regulation, immunology and molecular and cellular oncogenesis. Multi-disciplinary in its approach, the focus of the Institute is to investigate all types of cancers as well as viral and autoimmune diseases.